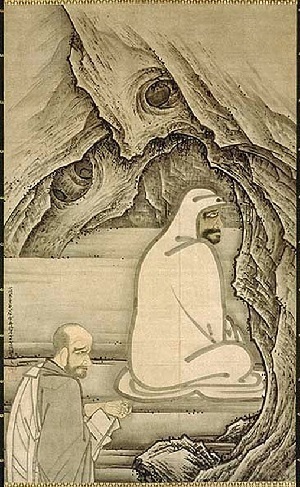 The master Fugai was considered very wise and generous, yet he was most severe both with himself and his disciples. He went to the mountains to sit in Zen. He lived in a cave, and when he was hungry he went to the village for scraps. One day a monk called Bundo, attracted by Fugai's austerities, called at the cave and asked to stay the night. The master seemed happy to put him up, and next morning prepared rice gruel for him. Not having an extra bowl he went out and returned with a skull he found lying near a tomb. He filled it with gruel and of offered it to Bundo. The guest refused to touch it, and stared at Fugai as if he had gone mad.